Last month our family had some bad news. A member was diagnosed with breast cancer. She had surgery and is on the path to recovery but I had to wonder. Why her instead of me or any of the rest of us? 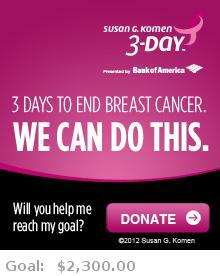 I decided to do something about it and join the fight against breast cancer and signed up for the Susan G. Komen 3 Day walk. Selfishly, it will also motivate me to exercise regularly. If this is a cause you’d like to support, I’d appreciate your donations to help me reach my individual fundraising goal of $2,300. Every dollar helps so just click that Donate button above. I’ve also added the button to the right sidebar if you want to come back later. I always love the recipes at Square Pennies but really enjoyed reading 20 interesting things I didn’t know about Maggie. Financial Samurai shares his experience using a credit card to buy a car. Do you think it’s doable? Another interesting list is 50 things My Broken Coin learned about America. One thing I learned while traveling is that Europeans call this country America while Americans say United States or US. Money Beagle learned events do come in threes. I really want some of those water froggies! Looking for a job? Untemplater has great interview tips including don’t stink! Thanks to all the blogs that included Bucksome Boomer in a carnival or round-up. If I missed you, please let me know so I can thank you publicly. Here is a list of personal finance giveaways. Do prizes like $1,500 CASH, an iPad, a FREE vacation or a $25 Amazon gift card sound good? Yeah, I thought so. The Extra Money Blog is celebrating 6,000 subscribers (WOW!) and hosting this generous giveaway. Enter before March 15th! Funancials is giving away a $25 Walmart Gift Card just for subscribing via email. Enter by midnight tomorrow. I’m sure you could find a use for a $50 Amazon Gift Card. Super Frugalette has one to give away. Enter no later than 2/29! Young and Thrifty has 5 H &R Block tax software codes to give away to Canadian readers. Enter in the next three days for your chance to win. Win an iPod shuffle at Black Freelancer. Enter this contest by February 29th. Life and My Finances is giving away a $100 Amazon gift card. Enter by midnight the 29th. Another Canadian only H&R Block tax software code giveaway is at Thirty Six Months. Three will win in this contest that ends at midnight the 28th. Well Heeled Blog is giving away a $25 Amazon card. Enter by March 1st. How about a giveaway for dinner and a movie? Enter to win gift cards for both at Surviving and Thriving by 9 pm tomorrow. Thanks for the mention I love your contest round ups. I’m so sorry to hear that one of your family members has been diagnosed. It sounds like it was diagnosed and is being treated early and aggressively. Thanks for mentioning my $100 Amazon Gift Card Giveaway! I love to give stuff to my readers! I’m so sorry about your family member, and glad she’s on the road to recovery. When my husband was diagnosed with breast cancer last year, I, too, went through the whole “why him?” thing especially since not many guys get breast cancer. Wishing you and her good health. PawPrint, I think not enough people know that breast cancer does hit men too. I hope you’re husband is doing well in his recovery. Thanks Kay Lynn- I’ll have a winner picked shortly!